Radical tread pattern design shifts more water from around the contact patch even at more extreme lean angles, whilst also ensuring more even wear throughout the life of the tyre. The latest in compound technology for fast warm up performance, even in cold conditions. Unique multi-grip technology which offers extended mileage and maximum grip when cornering, without the feeling of ‘step’ during transition. 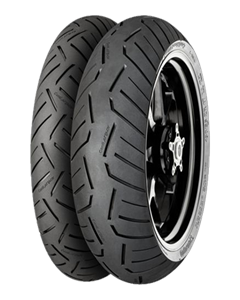 TractionSkin technology for improved rider safety, and minimal scrubbing in of the tyre from new. The patented zero degree belt technology offers excellent straight line stability at speed, perfect for meeting the combined touring bike demands of safety and comfort. Easy Handling Technology for superior line holding abilities and neutral steering.